You’ve probably heard the adage that your next job is likely to come from someone you know. While people find work through a variety of channels, your network may be more important than you realize. By analyzing hiring and networking data on LinkedIn, we uncovered how connections between members impact the way companies bring on new employees. On average, 16% of new hires were already connected to someone at the company prior to joining. For example, if your company hired 100 people, then on average, 16 of those new hires were connected to someone at your company before they came onboard. Many of these connected hires could have been formal referrals. However, it’s likely that many more were simply people who learned about the job opportunity from their professional network. Making professional connections is extremely valuable. If you are one of the many people looking to make an industry transition, get to know people in your desired industry by going to professional events, asking for introductions, or by being a shameless opportunist. 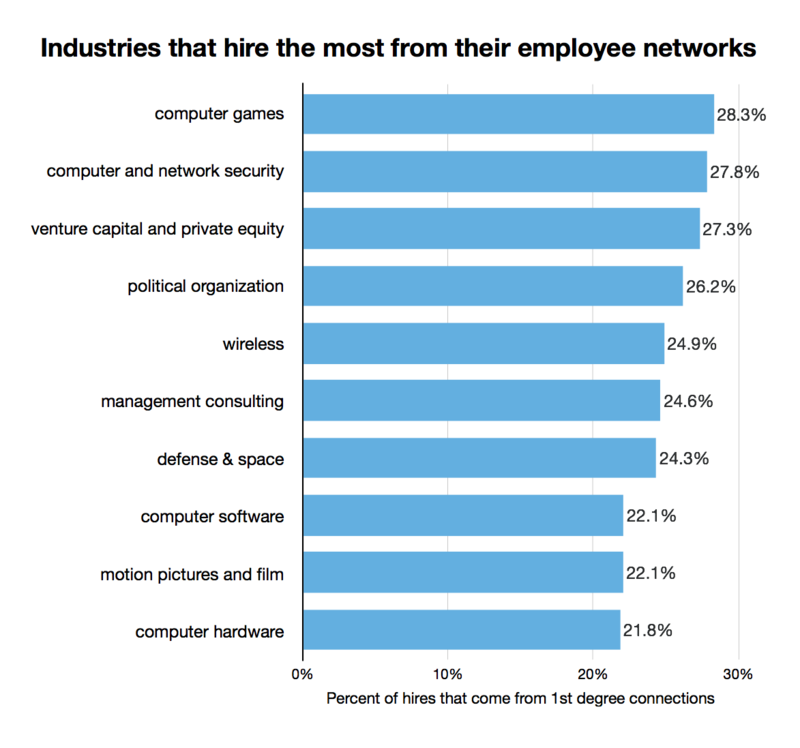 And on the opposite end of the spectrum are the industries that hire the least from their employee networks. Highly-specialized technical industries tend to hire from their networks more often than average. 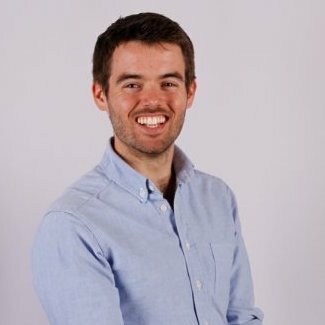 Employers in these industries are often looking for people with expertise in specific skills, and their current employees are likely to know people who share those specific skills - possibly attending the same schools, having worked together previously, or met at networking events in their field. These are also industries where referral bonuses can often be quite sizable. The computer and network security industry fits all of these descriptors, and is currently a hot field as a result of recent, high-profile attacks. One downside to this intensely narrow focus on specialized skills could be lack of diversity in the company - something the tech industry is regularly criticized for - which gets prominently featured in our top 10. When relationships drive deals, people hire from their networks. In venture capital, political organizations, and management consulting industries, roughly 1 out of 4 new hires come from employee networks. These are industries where relationships are important to closing deals and winning clients, so it’s not surprising that they also look to their extensive networks when it’s time to hire. 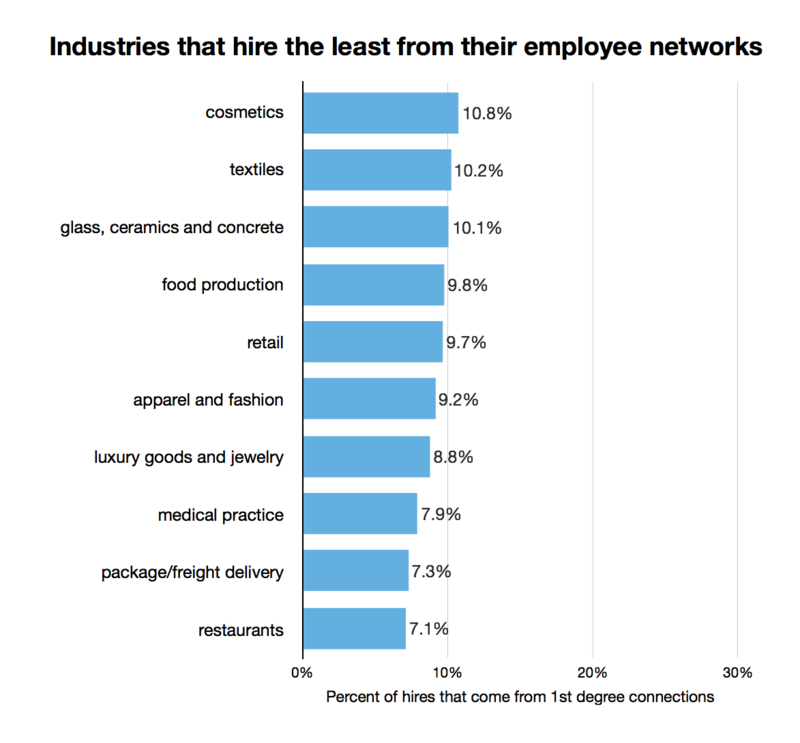 Retail, apparel and restaurant industries are less likely to hire from within their networks, with only 7-10% of hires coming from employee networks. These are often industries where students and new professionals with less-developed networks find their first employment opportunities. For jobs that rely heavily on inbound applications and formalized candidate screening processes, it’s not surprising that network hiring is less prevalent here. Whether you’re looking for an opportunity at a growing startup or an established enterprise, networking is going to make a difference. We found that the percent of hires that come from employee networks is roughly the same regardless of company size. As we continue to develop the Economic Graph, a digital representation of the global economy, we hope to empower our members by helping them make better career decisions, get new jobs, grow their business, and achieve economic opportunity. We isolated every member who created a new position at a new company during the month of October 2014. Then, we analyzed their connection history up to that point to determine if they connected with someone at their new company at least six months prior to starting the position. To produce the percentages above, members were aggregated by their new company’s industry and compared to the total number of new hires made during the month of October.